The Texas Rangers are becoming the Chicago Cubs of the American League minus seventy years of playoff failures. The other main difference is the Rangers aren’t cursed like the Cubs and are making a serious run at the AL West division title. My loyalty will always go to the Minnesota Twins, but as long as they’re not playing the Rangers, I’ll be rooting for Texas for the rest of the season. There are many reasons to root for Texas this season. It’s a low-profile team and not many know their history. Here is why I’m rooting for the Rangers (when they’re not playing the Twins). Vladimir Guerrero is on a tear at the age of 35 after many considered him washed up after an injury-plagued 2009 season featuring his lowest OPS in his career. He’s one of the most enjoyable players to watch. I’ve already written how great this guy is: https://tripleinthegap.wordpress.com/2010/05/29/the-class-and-talent-of-vladimir-guerrero/ . The fourth-year manager has improved the team’s record every season and is on pace to again this year. In an era where players have continuously abused drugs (mostly steroids) and then denied their actions, Washington showed everyone how to handle a bad mistake. After testing positive for cocaine last season, before the results were in Washington approached the upper management of the Rangers, admitted his mistake and accepted responsibility. Perfection shouldn’t be expected of anyone, but responsibility for ones actions should. Washington showed class in a situation that could have been a lot worse. 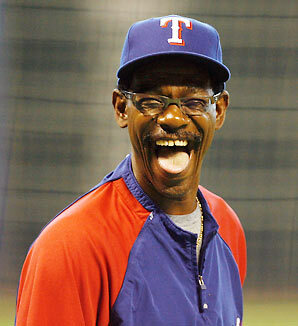 If you think Ron Washington looks happy here, wait until he wins the AL pennant. Anyone who’s followed baseball in the last three years knows the story of Josh Hamilton. He was drafted No. 1 by the Tampa Bay Devil Rays in 1999. 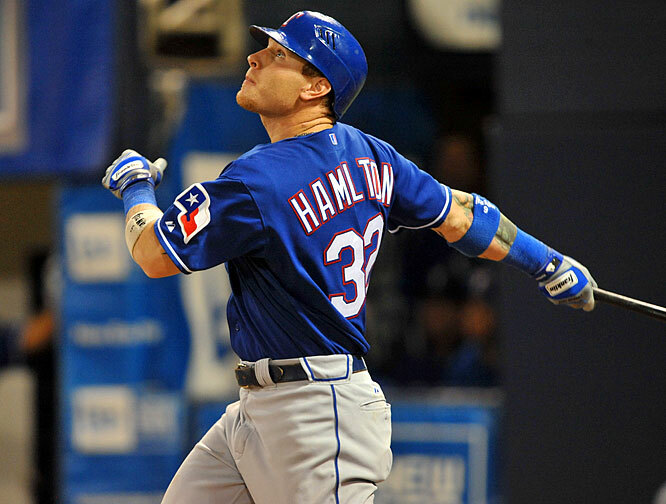 After an injury in the minors, Hamilton turned to drugs and eventually cleaned himself up and is playing better than ever in 2010. He’s putting up triple crown like numbers (.358 avg, 23 HR, 74 RBI) to compliment Guerrero, giving the Rangers a nasty 1-2 punch. After a monster 2008 season, Hamilton was injury plagued in 2009. He's back on track this season. After Kerry Wood and Mark Prior were overused during the 2003 season, it seemed every manager was babying his starting pitchers. Pitch counts ruled the mound and the complete game was becoming extinct. With hall of famer Nolan Ryan as the Rangers GM, all rules were thrown out. No, Rangers pitchers aren’t completing every game, but if they’re still throwing well late in the game, they’re likely to be left on the mound. Texas has been a team known for a lot of offense and little pitching, but no more today. The Rangers rank third in the American League in ERA this season with a mark of 3.80 (Tampa Bay leads at 3.65). The addition of Cliff Lee via trade with the Mariners only makes the pitching staff better – much better – and will make them dangerous in the postseason. The Washington Senators moved and became the Rangers in 1972. Texas combined for a 111-205 record those first two seasons. In 1977 the Rangers won 94 games, but Kansas City won 102 and took the AL West crown. The next season they won 87, but those pesky Royals took the title again with 92. The same difference in standings occurred in 1986, except it was the California Angels on top. The first time the Rangers did find themselves in first place after the last game of the season, they were under .500 (52-62) and the strike of 1994 was ahead of them. It was the first year major league baseball had six divisions and it really didn’t matter as there would be no playoffs because of the strike. It wasn’t until 1996 that Texas would find its way to the postseason. Things looked great when Juan Gonzalez homered to help the Rangers to a 6-2 win at Yankee Stadium. Unfortunately, this was the last and only postseason win for Texas. They’d lose the next three to the eventual Word Series champions, New York. They’d run into the Yankees in the division series again in 1998 and 1999 and both times New York would sweep the Rangers and go on to win the championship. The Rangers were just a stepping stone on their way. Texas was outscored in their three games in 1998 by a score of 9-1 with the one run on a single from Ivan Rodriguez. The next season didn’t get any better as the Yankees outscored the Rangers 14-1 with Gonzalez providing the single run with a homer. Texas is one of three teams never to reach the World Series (along with Washington/Montreal and Seattle) and are the only team never to win a postseason series. It’s their time. Everytime the Rangers assemble a World Series-ready team, they run into the Yankees. This year will probably be no different. Here’s hoping Texas can cast aside the evil empire. 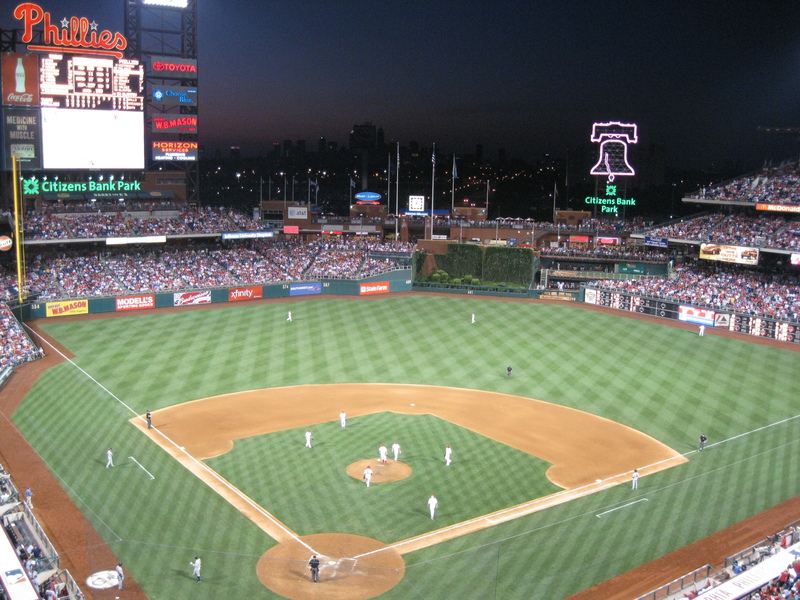 What Makes a Good Ballpark? Twenty years ago, it was easy to pick out which major league teams had the best ballparks and why. With the growth of new ballparks – since Camden Yards showed the world how it was done in 1992 – there aren’t many teams with poor places to watch a ballgame. The standard has been raised considerably. 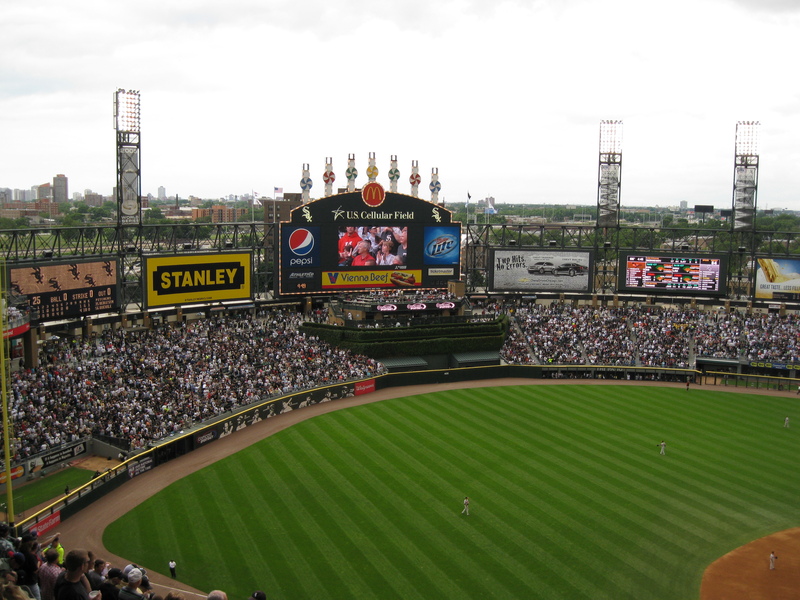 In 2010, what makes a good place to watch baseball? There’s so much to consider and everyone has their favorite luxuries of the new parks. Some like a retractable roof for uncomfortable weather. Some like an all-you-can-eat ticket. Some like to have ample parking and an easy exit after the game. A lot of people need the distractions of expensive alcohol and food, a perfect climate and a big store to buy overpriced souvenirs. Then there are simple baseball fans like myself that just want a good place to watch the game. Based on this simple premise, I’ll do my best to convey what makes a good baseball park and then rank the places I’ve been. I’ve never believed a good ballpark should be easy to get to … by car. The best parks I’ve been to across the country are in the heart of downtown. They’re not only in downtown, they’re a part of downtown. Baseball fields should be a small getaway from the business of an American workday. Workers of the city should be able to get off work and walk a few blocks to the ballpark to enjoy an evening game. There are some fine parks located in the suburbs, but there’s nothing like taking public transportation to the ballgame. Taking the “L” to a White Sox/Cubs game is like a good opening act at a concert. The car is abuzz with talk of the previous game as well as what to expect for today’s game. Camden Yards set the precedent for future parks on where to locate. When you’re in Oriole Park, you’re also in Baltimore. The same goes for Jacobs Field (now Progressive Field) in Cleveland and PNC Park in Pittsburgh, to name just a few. When I’m in Kaufmann Stadium, I don’t feel like I’m in Kansas City. The same goes for Miller Park in Milwaukee. One of the main differences between the cookie-cutter stadiums of the 60s, 70s and 80s and today’s parks is the closeness to the game. Watch footage of a game at Three River Stadium and you probably won’t see a fan on a ball hit to the gap. The outfield (and infield) walls were so high, it felt like a gladiator match in ancient times. As a kid growing up near the Twin Cities, I’d always go to the enormous impersonal Metrodome to see my Twins. The first time I went to a real ballpark was when I was 14 to see the Brewers at County Stadium. My dad and I walked around the concourse and he told me to sneak up to the first row by the Brewers dugout to take a quick picture. I was amazed when I got there to find Paul Molitor in the on-deck circle a few feet from me. Even if I was in the first row at the dome, I’d still have been 10 feet above him. At County Stadium, the players were on the same level as the fans and it was wonderful. The definition of a reasonably priced ticket will vary from person to person and I’m not going to put a number on it. I’ve walked away from some games and thought, “I could have paid $100 for that ticket and still been happy.” Then there’s the game where your team loses 10-0 to the Astros and you want your money back. Of course, a good ballpark can straighten that problem out. Towards the end of the Metrodome’s run, I absolutely despised seeing the Twins lose. I’d go inside on a beautiful summer evening, the Twins would lose and I’d think of all the wonderful things I could have done OUTSIDE for free instead of going inside to see my favorite team lose. Of the parks I’ve been to, face value of tickets aren’t too bad if you compare them with a popular rock concert or an amusement park. However, major league baseball is making even more money off fans with websites like Stubhub – just another word for scalper. I don’t believe in buying from second-hand sellers as most of the time it’s a poor value. Every part of the country is different and it shows with its baseball fans. I’ve been in visiting parks and have been treated wonderfully by the locals fans (thank you for the free tickets, man in Kansas City). Rarely have I had a bad experience with other fans, but I have heard stories. Those first few minutes in your seat is like playing the lottery. You just hope you’re surrounded by mature, yet enthusiastic, fans. You should never feel guilty for cheering or keeping to yourself. 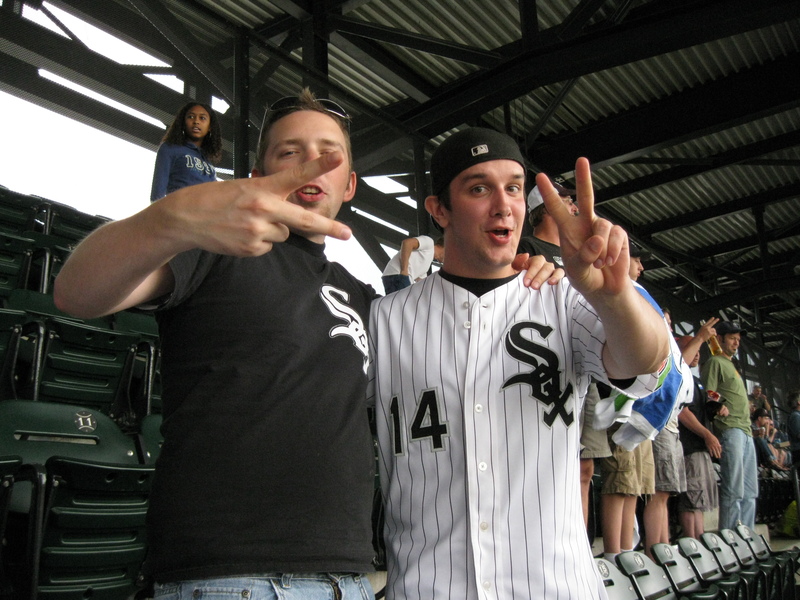 Two respectfully obnoxious White Sox fans. They were playing the Orioles, but I still wore my Twins cap. They let me hear it - respectfully. This part of the grading scale for ballparks is almost completely random at parks I’ve only been to once or twice. It’s all luck on who I happen to sit next to. A friendly and welcoming smile from a ticket taker or hot dog vendor can make the difference between feeling comfortable and alienated in a ballpark. A simple, “Enjoy the game,” satisfies me, as does a, “Thank you for coming,” as I leave the park. If you’re working in a ballpark, you should be enjoying yourself. The best service I’ve received was on my first visit to PNC Park in 2005. I was greeted with smiles from every staff member I made eye contact with. When I went to my seat, an old man, who probably has stories of Honus Wagner, took my ticket. He walked my girlfriend and I to our seats, wiped them down with a rag and said, “Enjoy the game.” I was flabbergasted. I’d never seen such a respectful gesture to a fan. If you sat on the third base line at the Metrodome, you were sitting in the “headache” seats. A friend of mine nicknamed them that because when he sat there, he’d have to turn his neck for the entire game to see all the action as the seats were aimed towards the center of the football field, not the baseball diamond. By the end of the game he’d have a screaming headache. Even if a fan buys the cheapest ticket available, he/she should be able to see all the action on the field without having to get a headache. There’s nothing like a cool breeze on a hot summer afternoon. This is something that wasn’t felt nearly enough at the cookie-cutter stadiums of the 60s and 70s. Even though Cinergy Field was an outdoor stadium, it was still fully enclosed and it’s tough for a good breeze to get inside. Not only can a good breeze get through an open-air park, but a good view too. One of the best examples is AT&T Park in San Francisco. The park was built right on the bay, giving fans a gorgeous view. Most downtown parks have skyline views that look great and give fans the sense of belonging to the city. Retractable roofs take away the beautiful views and the summer breeze. Baseball was meant to be played outside, even when conditions aren’t ideal. The weather never got much worse than this and the Mariners still chose to close the roof on the day I went. A home run should be an accomplishment for a batter. To hit a home run should mean the batter hit the ball really well in the air and not that the right field fence in Yankee Stadium is very short. A pitchers’ park is a baseball fan’s park. Not only are home runs earned, but there’s usually bigger gaps enabling more extra-base hits and more of a runner’s game. Right field at Yankee Stadium is an insult to Babe Ruth’s home run total. The man hit 714 home runs, but when you look at the right field dimensions where he played half his games, it’s less impressive. The same can be said for Roger Maris’s 1961 season. 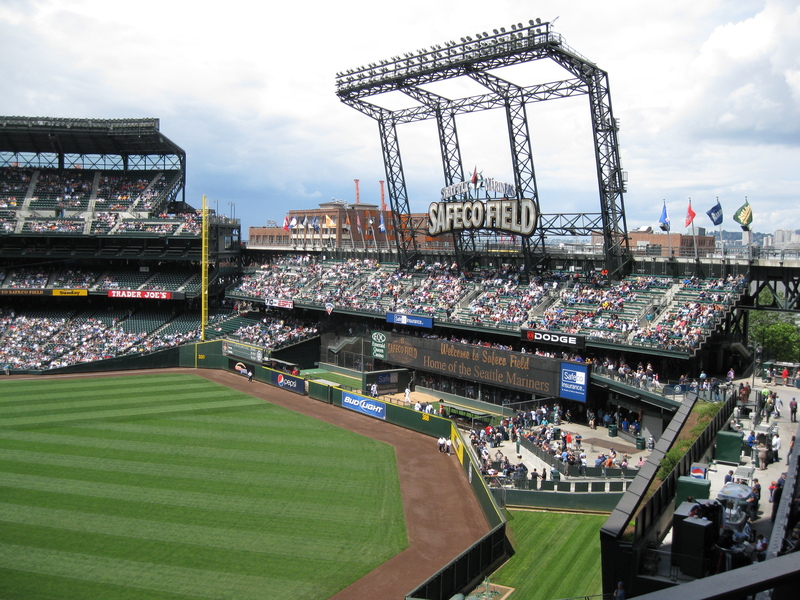 There are many other considerations for a good ballpark, but these are the major ones. Of course, good baseball will trump any ballpark deficiency. The game can be played in a sand lot, but if it’s good quality baseball, it doesn’t matter where it’s played. The following is a very unscientific rating of every ballpark I’ve been to. I say unscientific, because some of the parks I’ve only been to once and it was a long time ago. Some parks I know much more about (Metrodome) than others (Comiskey Park). The only problem with PNC Park is the team that plays there. I hope for the city of Pittsburgh,that the Pirates can turn things around in the next few years and at least produce a .500 team. The Pirates have a great history and it shows at PNC. 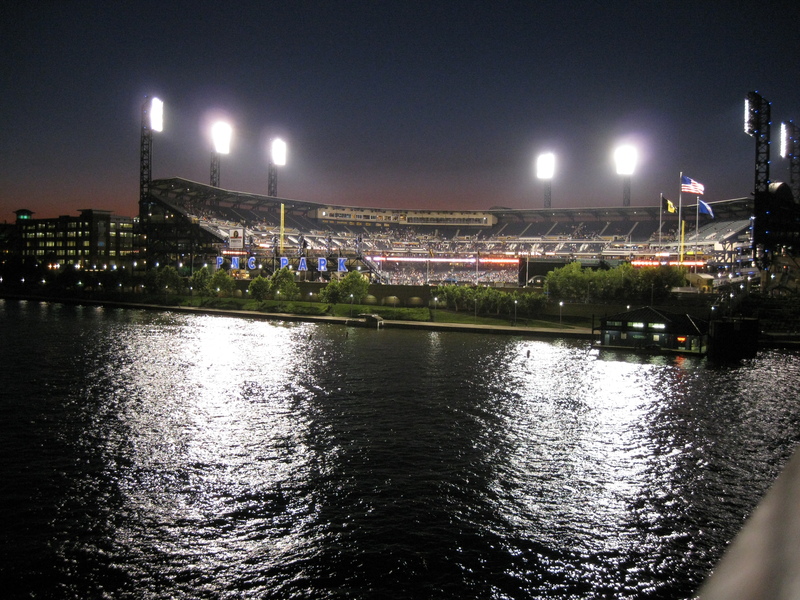 Everything from the service to the beautiful view of the city and the Allegheny River to the wonderful sight lines make PNC Park the best place to watch baseball. Even with my obvious bias to the Minnesota Twins, PNC Park is the best place to watch baseball. I’ve only been to one game and its popularity is getting very annoying to me. Where were all these fans for the last decade? As a fan who would go to five or six games a year, mostly last-minute decisions, Target Field has been horrible. But it’s horrible only because it’s so great. For years no one wanted to pay for it. No one’s complaining now. Then everyone wanted one of those horrible retractable roofs. Thank you, Bill Smith, for not putting one on. 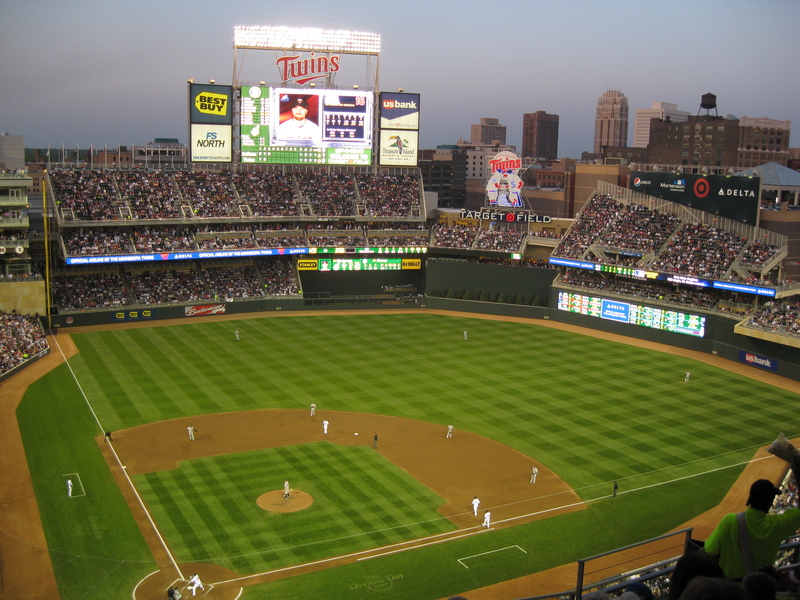 Everything about Target Field was done the right way, except the fact that a very big Twins fan in Eau Claire, Wisconsin, can’t go to a game at the last-minute anymore. Like a new restaurant, Target Field won’t be so new anymore next season and I can get back to my last-minute trips to Minneapolis. The only thing I don't like about Target Field is my inability to find a ticket at the last-minute. I’ve never attended a game, but I did take a tour in November of 2006 and even with the field covered and no Giants in sight, AT&T Park blew me away. The view of the bay is beautiful and the seats are right on top of the action. The two Tigers roar and their eyes glow when the home team hits a home run. Comerica is a perfect example of a park with a great sense of community with the city. It also has a great connection to Tigers history with statues of former greats in center field. Cleveland went from one of the worst parks in baseball history (so I’ve been told) to one of the best. Progressive Field revitalized downtown Cleveland when it was built and helped build a dynasty throughout the 90s. Walking around the home of the Royals in the summer of 2006 I couldn’t help but think, why didn’t every team design its park around this one? It was built in the 70s and has all the personality of the newer parks like an open concourse and great sight lines. Kaufmann Stadium made me despise the Metrodome even more knowing the planners had a great blueprint in Kansas City and chose to ignore it. 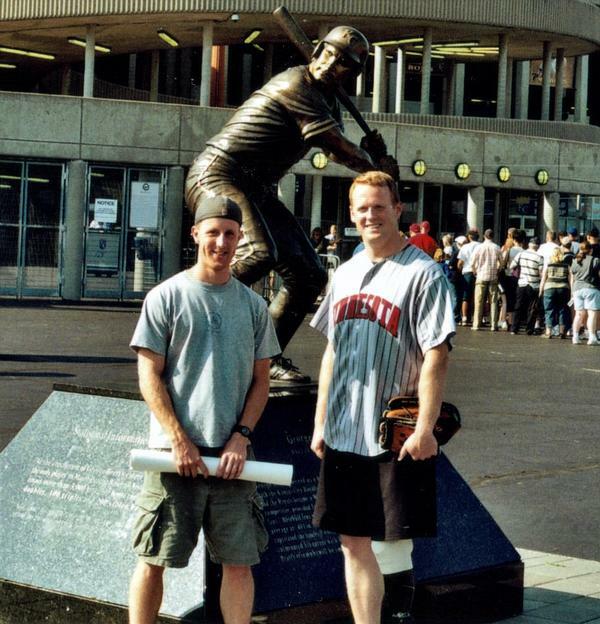 Myself, left, and my good friend Nick standing in front of the George Brett statue outside of Kaufmann Stadium - 2006. Many fans like to give Wrigley Field, Fenway Park and the old Yankee Stadium extra credit because they’re old and have more history. Yes, I appreciate the history of these parks, but that’s for another blog. Having said that, Wrigley Field is still a great ballpark. It doesn’t have the distractions of most modern parks and instead focuses on the game. The one downside the Wrigley Field is the problem finding an affordable ticket. I was 15 in 1993 when I went to Oriole Park with my parents. Like PNC Park, it’s a shame the home team is what it is for such a beautiful park. I was fortunate enough to see the great old ballpark before they tore it down. We sat in right field so I could see Dave Winfield who was playing for the Angels at the time. The home of the White Sox is an underrated ballpark. It was built before the great expansion of the retro parks, but it still stands as a good open-air park on the south side of Chicago. U.S. Cellular Field is a great place to watch some good AL Central baseball. 12 – Nationals Park, Washington D.C. It lacks with any sense of character, but makes up for it with great sight lines and a great atmosphere to watch a ballgame. Fans get to chill with the Nationals’ mascots before games: Teddy Roosevelt, Abe Lincoln, Thomas Jefferson and George Washington. 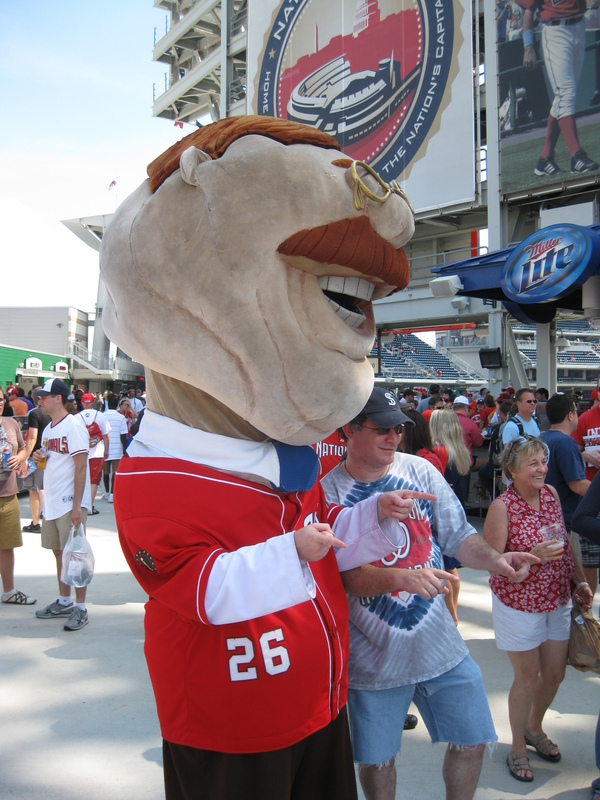 Mascot Teddy Roosevelt poses with a fan before the game. A beautiful park on the outside of town. It was built with a lot of room to spare. The creators could have spread it out a lot more, but didn’t and kept the intimacy. Built in a similar area as Miller Park in Milwaukee, Citizens Bank Ballpark was done the right way. Busch Stadium fits nicely into downtown St. Louis and offers a great view of the arch. The biggest downside is its lack of an open concourse. I know many call Candlestick Park one of the worst parks in the history of the game, but if I’m basing my ratings on the days I visited, I have to rank the former home of the Giants fairly high. My parents and I walked to the park in shorts and t-shirts and were surrounded by people wearing long-sleeve shirts and even parkas. We were worried the temperature would drop, but it never did. In fact, I can remember my neck getting sunburned as I sat in the left-field stands watching Barry Bonds. Yes, Brewers fans, you should have kept your old park. No, County Stadium doesn’t appeal as much to the masses, but I loved it. It was the first outdoor park I attended and it got the fans right next to the action. Like AT&T Park, I have yet to attend a game at Fenway Park, but I have taken the tour. It’s a great park jammed into a great part of town. I can’t say I was impressed with the ticket prices or the fact that they closed the roof on a beautiful June afternoon. It was a bit chilly, but it’s Seattle! A great pitcher’s park within view of downtown. I’m not a fan of retractable roofs, but I would imagine it’s almost necessary in the desert. Although, don’t all the locals say, “It’s not that bad. It’s a dry heat.” If it’s not so bad, maybe they don’t need the roof. Every ballpark listed above is, at worst, a good ballpark. Instead of calling these last four the ballparks at the bottom of the good ballpark list, I’ve seperated them to let my readers know I think they deserve a failing grade. I don’t like the Yankees and I really don’t like it when fans try to talk about the history of the House That Ruth Built as if it wasn’t renovated in the 70s to make it look almost nothing like the original. Line drives that would either be caught by a right fielder or short of the warning track go over the fence in Yankee Stadium. The new one looks like MGM Grand Stadium. Brewers fans love Miller Park and I used to buy into the House That Bud Built. The city of Milwaukee has lots of great lakefront property and it’s a shame the Brewers didn’t take advantage of that. The retractable roof is not necessary in a city with wonderful spring, summer and fall weather. The roof has only softened Brewers fans as it is closed whenever the temperature isn’t perfect and there is a threat of rain in La Crosse. There’s ample parking and tailgating right outside the park, but they forgot to add more than one exit. It takes longer to leave Miller Park than it does for the pitching staff to find the strike zone. There’s nothing worse than going inside on a beautiful Minnesota summer evening to see the Twins lose. At Target Field, if the Twins lose, at least fans can say they spent the evening outside. The Metrodome was basically built for the Vikings and they fit an awkward baseball field in there for the Twins. A horrible place to watch a great team. 1 – RFK Stadium, Washington D.C. The one game I attended in 2005, the heat was so unbearable (thanks to being totally enclosed with no chance for a breeze) I thought, “This is the one instance I’d rather be inside to watch a ball game.” We pretty much were inside, except there was no fans or air conditioning. Here, finally, is the greatest game I have ever attended. I’m fairly certain it will forever be my No. 1 game, but that could change should the Twins find their way back to the World Series. There was no need to put into detail which World Series he was talking about. Those were the words of my mother that Sunday morning. The heroism of Kirby Puckett sent the Twins to a deciding Game Seven of the World Series the night before. My screaming headache was gone after a couple Tylenol’s and a good night’s sleep. Back to my mother’s comment, there are two things I can’t stand about watching ball games with her. One is she’s a ball of nerves during close games. The Twins will be playing Kansas City in early May with the tying run on third for the Royals in the ninth inning and my mom can hardly watch. She doesn’t get excited, she gets scared. The other thing she likes to do is judge players based on either one good or bad game she saw or their looks. Because of this, the Twins’ Gene Larkin was screwed from the beginning. First off, he’s a little funny looking with his dark thick eyebrows and pale face. To go with that, there must have been some game in the regular season where Larkin came up in a big situation and struck out and my mom was watching. It doesn’t matter if Larkin would go on to win the MVP award; he was no good in my mom’s eyes. I heard that throughout the 1991 season. 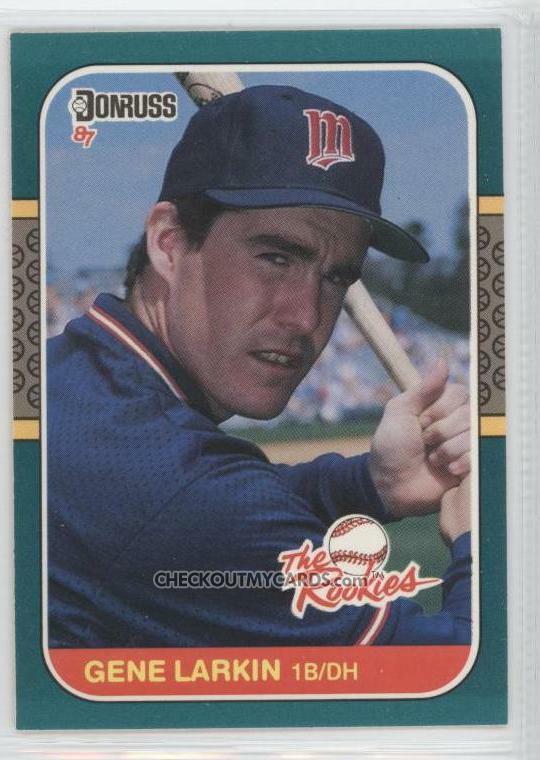 It didn’t matter when I told my mom he was batting .280 and got on base a lot (Larkin batted .286 with a .361 OBP in 291 plate appearances in 1991 – fantastic numbers for a role player). He failed while she was watching and he’s not as cute as Dan Gladden. In 1991, no one in the Metrodome realized how legendary the pitching match-up would be. Sure, everyone knew the St. Paul native Jack Morris was already a legend. Morris already had a World Series ring with the 1984 Tigers and was the winningest pitcher of the 1980s. Before the season began, many believed Morris was past his prime, but he proved them wrong with 18 wins and a 3.43 ERA over 246 innings. Everyone knew about Morris’ past, but no one could predict the future of the Braves’ starting pitcher, John Smoltz. He grew up in Michigan idolizing Morris when he played for the Tigers. Smoltz was a young pitcher with little on his resume in 1991. No one knew he’d become one of the most dominating pitchers of the 1990s and 2000s, both as a starter, then a nasty closer and then back to a starter. The Twins won 95 games during the regular season. The Braves won 94. It seemed only fitting that the championship for those two almost identically talented teams came down to the last game of the year. At this point four of the six World Series games were decided by one run and three of those were decided in the final at bat giving the home fans plenty to go crazy about. The Braves leadoff hitter, Lonnie Smith, seemed to realize how closely matched these teams were and how hard they’d worked when, before leading off the game, reached out and shook the hand of the Twins catcher, Brian Harper. I had never seen such a classy show of sportsmanship at that point and wouldn’t again until the 2004 playoffs when the Los Angeles Dodgers shook hands with the Cardinals after St. Louis booted them out of the playoffs in three straight games. As much as I despised the Braves for the decade, I have to say they played the game with respect. There’s really not much to report on for much of the game. Morris and Smoltz took over from the first pitch. It was wisdom and experienced grit against youth and energy. 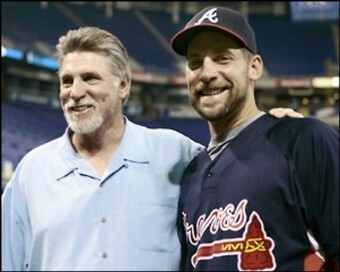 Jack Morris, left, and John Smoltz, years after their Game 7 matchup. Once the game hit the fifth or sixth inning and there was still no score, my mom started to get nervous. I was nervous, too. Sitting in the upper deck in left-center field, the tension would easily be felt. No one could score, let alone get close – until the eighth. Smith started the top of the eighth with a single for Atlanta. What happened during Terry Pendlton’s at bat, with Smith on first, would not be believable in a story. The baseball Gods must have wanted the Twins to win because the Braves should have scored. It’s one of those eerie baseball moments much like the bottom of the ninth inning of Game Six of the 1986 World Series. Smith was in his fourth World Series with his fourth different team. Pendleton, who’d sat out the 1987 Series when he was with St. Louis, seemed to be making up for his absence. Pendleton slapped an easy double off the left-center field warning track. After hitting the wall, the ball hung in the air above the heads of Puckett and Gladden, for what seemed like two minutes. The baseball ghosts invaded the Dome while everyone was focused on that floating ball. Everyone, that is, but Lonnie Smith. On his way to second base, Smith got confused. The Twins shortstop Greg Gagne and second baseman Chuck Knoblauch pretended they were fielding a double-play ground ball. Did this confuse Smith? Maybe. Did Smith simply lose track of the ball? Maybe. Did the baseball ghosts hold up Smith after rounding second base? Who knows what was going through his mind, but as Gladden and Puckett were scurrying for the ball, Smith stopped and watched, still in the second-base dirt. Eventually, he made his way to third. Without the delay, he may have scored. The Twins were still no where near the end of the inning. Atlanta had runners on second and third with no out. Ron Gant stepped to the plate, only having to hit the ball past the drawn-in infield or to hit a fly ball to the outfield to put the Braves up. Normally a power hitter, Gant did the opposite when Morris got him to hit a weak grounder to Kent Hrbek at first base. Hrbek tagged Gant and held both runners from advancing. Morris intentionally walked Justice to load the bases and set up a hopeful inning-ending double play with the Braves’ Sid Bream due up. What’s more exciting than a home run in the World Series? A 3-2-3 double play to end an inning where the opposing team started the inning with runners on second and third and no out, that’s what. Bream hit a solid grounder right to Hrbek at first base. He threw right to Harper at home to get the force out who then threw a strike right back to Hrbek get Bream. Hrbek pumped his fist in celebration and the Metrodome exploded. I can remember being a bundle of nerves, wondering if I’d be watching the Braves celebrate a win on our field. It was so damn exciting, yet it was so nerve-racking – and I was 13! It’s an age where you still look up to the ball players. They’re your heroes. They’re almost mythical. When I speak to friends who are Milwaukee Brewers fans, I feel a little sad for them. The Brewers are a great team with a storied history, but they don’t have that World Series championship. It’s moments like the top of the eighth inning of Game Seven that Brewers fans don’t have and I sincerely wish they did … even if they do root for Milwaukee. Every baseball fan between the age of eight and 15 deserves a World Series title. I realize how blessed I was to have two of them. It looked like the Twins were going to take the lead in the bottom of the eighth with the bases loaded and Minnesota native Hrbek at bat. It was at this point, I thought my nerves couldn’t get worse. Hrbek lined into a double play to end the inning. Smoltz had been replaced, but Morris went out there again for the ninth inning. “Morris is still pitching!” I said to my mom. Twins manager Tom Kelly had warmed up a few pitchers, but he kept with Morris. “Oh, my God, Jack Morris is going out there again!” I told my nerve-racked mom. I’d never seen a pitcher go 10 innings, much less in a World Series. It was working as Morris retired the side to set up the Twins half of the 10th. Leading off was Gladden. He’s not the most talented player on the Twins, but he may have been the hardest working – always giving his all. His broken-bat blooper off Alejandro Pena landed between the Braves’ centerfielder and leftfielder. 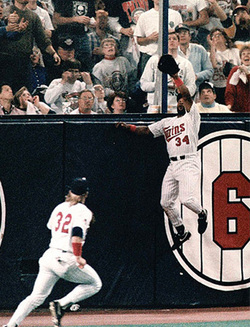 The dome-field advantage kicked in as the ball bounced above the jumping Brian Hunter and into the David Justice’s glove in centerfield as Gladden hustled to turn his single into a double. The throw to second came just as Gladden did. He slid into second a split second before being tagged. SAFE! The Twins horrible stadium and hustle had put a runner on second with no out in the bottom of the 10th inning of the seventh game of the World Series. Metrodome, I won’t miss your stale atmosphere, narrow concourse, football seating, ugly turf, uglier roof, nasty hot dogs, nosebleed seats, bad sound, horrible sight lines, or anything else, but I will miss the Twins’ advantage when we play at home. Knoblauch, the American League Rookie of the Year, was up next. What he did was boring, yet extremely important and underrated. He bunted … perfectly, getting thrown out by third baseman Pendleton and sending Gladden to third. With one out and a runner on third, the Braves needed a double play, so they walked Puckett and Hrbek to load the bases, giving them any base to throw to. It was Chili Davis’ spot in the order, but he was taken out for a pinch runner in the ninth. Jarvis Brown was due up, but Tom Kelly knew he needed a better bat. My mother groaned in horror. The Braves had their fielders in. Even the outfielders were shallow in case a hit got through, there still might be a chance to throw out Gladden coming home. If there was a shallow fly ball, they’d be able to throw him out if he tagged. With the bases loaded, one out and the Twins’ season was held in the hands of their backup first baseman. The hit came right at us in left-center field. The Braves outfielders didn’t make much of an effort knowing that even if they caught it, it was so deep they’d have no chance of throwing out the speedy Gladden at home. It bounced once off the left field turf and the crowd exploded – I did nothing. It bounced twice, the crowd was hemorrhaging, Gladden was on his way home to an ecstatic Jack Morris and the rest of the Twins bench – I stared at the ball. It bounced a third time (747s are quieter than this crowd) and Gladden and Larkin are being mobbed by teammates in two separate piles of celebration – I finally realize what just happened. 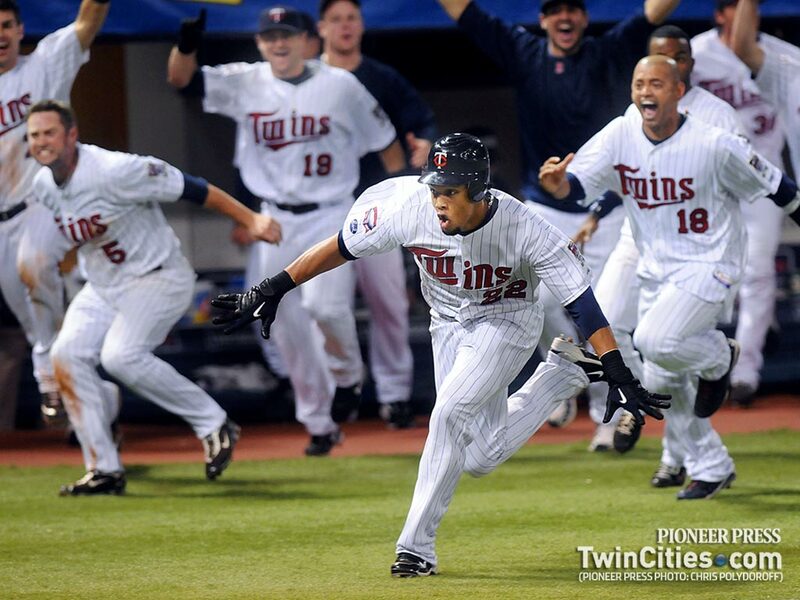 The Minnesota Twins, my team, just won THE greatest World Series of all time. My words were more out of shock than excitement. It was a lot like graduating: You were more surprised it was finally over than excited for the outcome. It seemed like it would go on forever. I jumped up and down, I hugged my mom, I screamed, clapped and waved my Homer Hanky. I’m not sure if the tears came from happiness or the collapsing of nerves or both, but I couldn’t hold it back. Many baseball writers point to the 1975 Series as the greatest or the 2001, but I disagree. Nineteen-ninety-one gets looked over only because there were two small-market teams. The 1975 Series had Boston and Cincinnati while 2001 had Arizona and the Yankees. The ratings may have been higher for those, but they weren’t as great. The Diamondbacks and Yankees came close with three games decided by in the last at bat including the seventh. The 1975 Series is famous for Game Six and a good Game Seven. Nineteen-ninety-one had five games decided by one run, three went into extra innings and four were decided in the last at bat. It was the greatest World Series ever. I was there, my team won and I know how blessed I am. 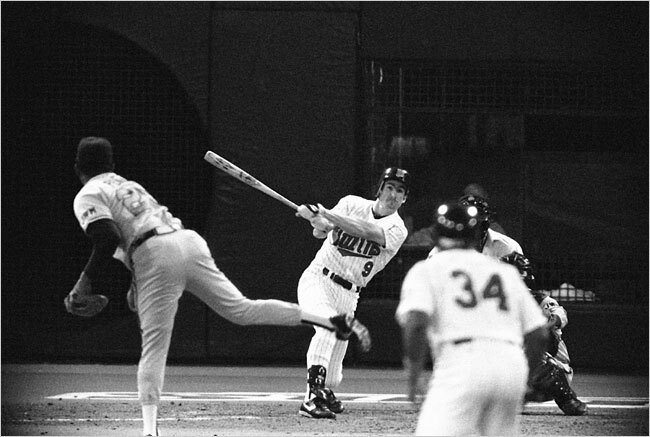 The final swing of the 1991 baseball season. Never in my life have I been so happy while feeling so much physical pain. That’s how the second greatest baseball game of my life ended: joy-filled pain. The Twins were down three games to two after losing three straight in Atlanta. The first two were nail biters decided in the last at bat, but in the third game down south the Twins were trounced and things weren’t looking good. There may have been bigger markets or greater teams to play in the Fall Classic, but there was never a better World Series than 1991. Legend has it that legend Kirby Puckett began to turn things around in the clubhouse before the game when he told him teammates he’d carry the load that night. My dad and I went to the Saturday night game and took the same seats we had for Games One and Two: half-way up the upper deck in left-center field. Jim Jackson kept warning his 13-year-old son that day, “Now, they could lose today. I hope you’re prepared for that.” I wasn’t. Luckily, the situation never arose. The Twins had 20-game winner Scott Erickson on the mound while the Braves had Steve Avery who’d been hot in the postseason. 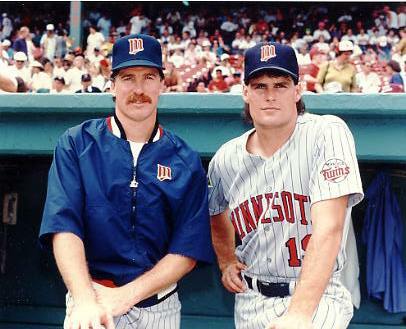 Jack Morris and Scott Erickson, responsible for 38 regular season wins in 1991. Morris started the All Star Game that would have been started by Erickson if not for an injury. Puckett made good on his promise to his teammates in the first inning when he tripled to score the game’s first run. A few batters later, the Twins’ Shane Mack knocked in Puckett to break out of a 0-for-17 slump. Puckett made better on his promise in the top of the third when Atlanta’s Ron Gant drove, what should have been at least a double, to left-center field. Puckett leaped up and caught Gant’s fly in mid-jump. For once, I was glad I wasn’t in my seat when this happened. My dad and I went to use the restroom and grab some food while the Braves were up. We were about to order food as I was watching the televisions in the concourse. “He caught it!” I yelled to my dad. Maybe I didn’t say those exact words, but that’s what I think of probably because that’s what TV announcer Jack Buck yelled, more in surprise than excitement. Terry Pendleton was on his way to third when the catch was made. He had to touch second and get all the way back to first. Puckett, in his own excitement, tried to throw the ball all the way to first base on the fly instead of hitting the cut-off man and probably getting the out. I may have been getting a Coke and nachos in the concourse, but I can still say I was in the Metrodome when Kirby made this catch. Not only was this game tension filled, but I was sitting in front of a whistler. In my younger years, I was prone to headaches. The whistler behind us didn’t help. My guess is the headache was there before the whistler, but it got a lot worse with his constant screeches of pain to my brain. My head was throbbing, but we weren’t going anywhere. After the Braves tied the score at two in the fifth inning, Puckett’s sacrifice fly in the bottom half put the Twins ahead 3-2. In the seventh, Atlanta tied it again, sending Erickson out of the game. The pitcher’s duel began. One more Atlanta run and the Braves would win the World Series in front of my eyes. One more Twins’ run and we’d survive to play Sunday night for the title. Our backs were against the wall, the game was tied late and my head wouldn’t stop pounding. The game went into extra innings and there was no real threat of scoring, not even when the Twins did score. Braves manager Bobby Cox sent veteran Charlie Leibrandt to the mound in the 11th inning. Puckett led off the inning. Puckett told Davis he was going to take a few pitches first. Davis laughed knowing the Puckett rarely takes pitches and even likes to swing at anything within the Metrodome confines. Puckett did take three pitches, sending the count to 2-and-1. Leibrandt’s next pitch was a change-up that Puckett sent into the center-field seats. TV announcer Jack Buck summed up the situation perfectly from the crack of Puckett’s bat. Puckett’s face rounding the bases is pure baseball joy. You can see the adrenaline oozing out of him. He was greeted at home by him teammates and over 55,000 screaming, insane fans. He stomped on home plate, grabbed two of the closest teammates and lifts them in the air. With all his teammates so closely gathered around home, it almost looks as though he’s lifting the entire team with his two arms. In his retreat to the dugout after giving high fives to anyone within range, Puckett stops in front of his manager, Tom Kelly, hugs him and buries his head into his chest. The game was over and he made more than good on his promise to carry the team to Game 7. While this is happening, probably 60 seconds after the final pitch was made, my dad and I are already 100 yards from the Metrodome. Puckett’s home run was hit directly in front of us. I think my dad was the first to realize it was going to be a home run because the second it reached the stands we already had our coats on and were heading to the nearest exit. My headache had reached nasty status and my dad isn’t a fan of fighting traffic. We reached the front row of the upper deck, about to go through the tunnel and out the doors when I looked back at the field and saw Puckett and his teammates gathered around home plate. I had never seen a walk-off home run in person. “Yeah,” my dad said, excited about the game, yet in a hurry to get his aching son home before the traffic stopped our momentum. Our truck was about a quarter of a mile from the stadium and in between were many parking lots, streets, short fences and drop-offs. We jogged all the way back, dodging parked cars, moving cars, hopping fences and jumping down curbs and drop-offs. No other 48-year old father and headache-stricken 13-year-old boy could have made better time. I put my head down on the seat on the drive home while my dad and I listened to WCCO and the reply of the game. At the time I might have thought there was no way the seventh game could top the sixth. The World Series already had four of its six games decided by one run. Two games had gone into extra innings and three were decided in the last at bat. In the post-game interviews, manager Tom Kelly seemed to know something special was going on. “It’s a storybook World Series. Chapter six is over and now we turn the page. What’s going to happen tomorrow in chapter seven, Game Seven? Oh my God, I can’t wait,” Kelly said as he turned his cap backwards like a kid giddy to begin the game. There’s no way Game 7 could be as exciting. 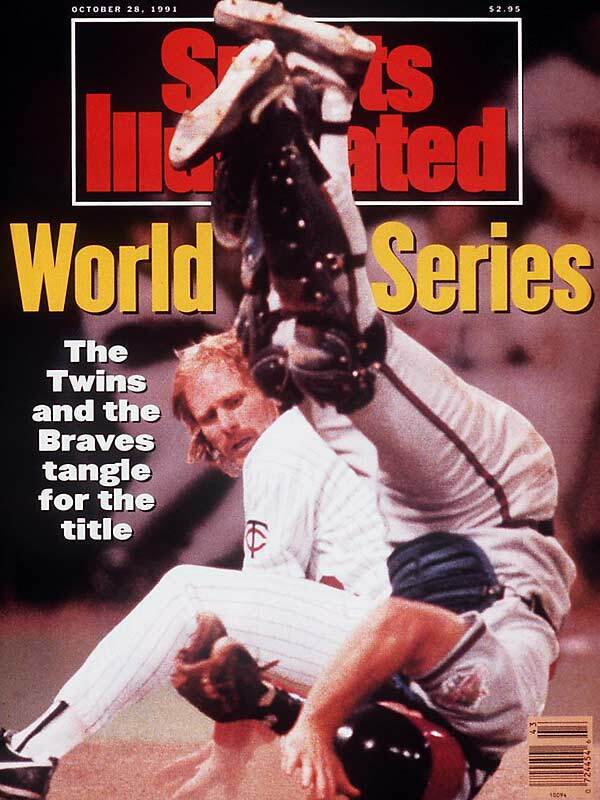 The Twins would have the old horse Jack Morris on the mound while the Braves were scheduled to start some young guy by the name of John Smoltz.